I think it’s worse this year, but there are a few other things going on that are exacerbating my symptoms. I seem to have a weird form of it, which starts in late July or August, when my body begins to notice the reduction of light, even though summer is at its peak. Even though I detest winter, my mood starts to pick up in late January or February, when my body notices the lengthening days. I’m at my best in April – June and at my worst in November and December. My SAD seems to imitate the sleep/wake patterns of hibernating animals. 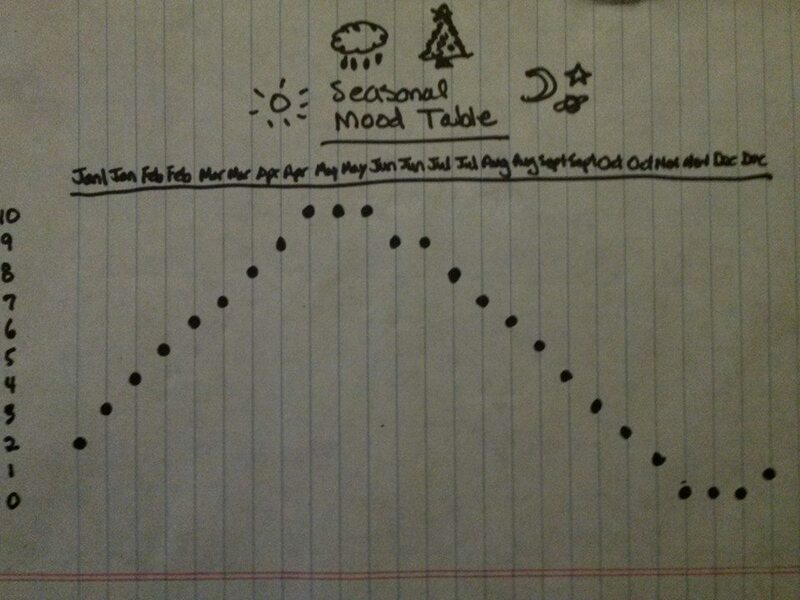 Graph I made showing my moods throughout the year. This never varies much. Here’s an overview of what SAD is, from mayoclinic.org. Treatment for SAD may include light therapy (phototherapy), psychotherapy and medications. In most cases, seasonal affective disorder symptoms appear during late fall or early winter and go away during the sunnier days of spring and summer. However, some people with the opposite pattern have symptoms that begin in spring or summer. In either case, symptoms may start out mild and become more severe as the season progresses. Your biological clock (circadian rhythm). The reduced level of sunlight in fall and winter may cause winter-onset SAD. This decrease in sunlight may disrupt your body’s internal clock and lead to feelings of depression. Serotonin levels. A drop in serotonin, a brain chemical (neurotransmitter) that affects mood, might play a role in SAD. Reduced sunlight can cause a drop in serotonin that may trigger depression. Being female. SAD is diagnosed more often in women than in men, but men may have more-severe symptoms. Age. Young people have a higher risk of winter SAD, and winter SAD is less likely to occur in older adults. Family history. People with SAD may be more likely to have blood relatives with SAD or another form of depression. Having clinical depression or bipolar disorder. Symptoms of depression may worsen seasonally if you have one of these conditions. Living far from the equator. SAD appears to be more common among people who live far north or south of the equator. This may be due to decreased sunlight during the winter and longer days during the summer months. Treatment can help prevent complications, especially if SAD is diagnosed and treated before symptoms get bad. This entry was posted in Seasonal Affective Disorder, Uncategorized and tagged depression, major depression, mood disorders, SAD by luckyotter. Bookmark the permalink. TEN star excellent post. I pinned your Winter/Summer SAD graphic to my Depression & BiPolar board for a quick way to get back here when I’m ready to take on the topic of Depression on my blog (as you probably know, pins link to originating posts). Thank you so much for putting this together. Thank you! I’m glad you’re helping disseminating this info. Some people may not realize their depression is caused by the time of year. You’re welcome. I have known for 25 years that disrupted chronorhythms and resulting hormonal changes due to differing light exposure can cause depression in the winter and, as you point out, hypomanic states in the summer – and not just for the diagnostically bipolar. For some, ADD/EFD hyperactivity can be exacerbated in the summer. I’m always surprised when I become aware of people who are unaware of SAD – and dismayed when they disbelieve that it is an authentic problem. Think I may have both! But seriously, sunny days do lighten my mood. Mine too, but not when they’re really short. This is great information. I used to think this only happened in Winter, but I am beginning to see how it can affect a person potentially year round. Good info. I shut down from November until May. I’m not diagnosed with this, nor do I wish to jump on the bandwagon, but just wanted to let you know I understand. I literally feel empty inside all winter, like my existing doesn’t even matter, until Springtime. That’s why I don’t like Fall, I know my soul will be sad in the months following it. It’s like I go to sleep like the trees do. I think I have a mild form of this. I notice my mood starts to go down when the days get noticeably shorter and begin to perk back up when the days get longer. Lauren Greece is a common destination for people with SAD in Switzerland amd Germany. I also think Nov is the worst month of the year . November is the worst. December would be except Christmas sort of cheers things up, if you’re into all of that. It’s not my favorite time of year. It causes me a lot of stress and some sadness too, but I actually usually enjoy Christmas Day, just not the weeks of hype leading up to it. I’m always relieved when it’s over!